Only 2 km from our apartment hotel is the famous town of Talamone. Talamone stands on the southern border of Parco della Maremma Nature Reserve; an archetypal walled town which dominates the stretch of coastline extending from the town to Monte Argentario. Nestled between the deep blue sea, and the green tones of typical Mediterranean macchia scrubland and pine forests, Talamone has been inhabited since prehistoric times and was an important center for the Etruscans (the ancient city of Tlamu). In 1860, during their journey from Genoa to Sicily, Giuseppe Garibaldi and his Thousand stopped briefly at this port to take on water and weapons. Orbetello sits in the middle of a lagoon of the same name and is linked to Monte Argentario by a man-made causeway. The surrounding area offers a variety of fascinating natural habitats: lagoon wetlands, sandy beaches, pine forests and Mediterranean scrubland. Taking an historical view, the town was first inhabited by the Etruscans, then by the Romans before coming under the rule of the Aldobrandeschi family, the Orsini family, and later the state of Siena. Finally in 1557 it became the capital of the Stato dei Presidi (state of garrisons) and fell under Spanish authority. In 1707 the Spanish were supplanted by the Austrians, then the Bourbons, until it became part of the Grand Duchy of Tuscany. Each of these periods have left influences on the area’s culture, wine and food. Visible traces can also be seen in the remains of the Roman city of Cosa, in Etruscan rock-cut architecture, the numerous churches, the Polveriera Guzman, a gunpowder magazine built by the Spanish and the original windmill rising out of the lagoon. These days Orbetello is a popular tourist destination with important fishing and fish farming industries. Produce includes sea bream, sea bass, bottarga (cured mullet roe), eels in vinegar (anguilla scavecciata) and smoked eel (anguilla sfumata). The Orbetello WWF Wildlife Reserve is a wetland of international interest and the most important lagoon on the Tyrrhenian coast. It serves as one of the key winter nesting areas in Italy for many birds, including flamingos, egrets, spoonbills and stilt plovers. The Duna di Feniglia State Nature Reserve is 6 kilometers long and stretches over an area of 474 hectares, separating the open sea from the Levante di Orbetello lagoon. As an ecosystem, it is ideal for birdwatching as well as for photographing deer, wild boar, foxes and badgers. Enjoy walking or cycling among green Mediterranean vegetation, on paths leading straight to unspoiled beaches. 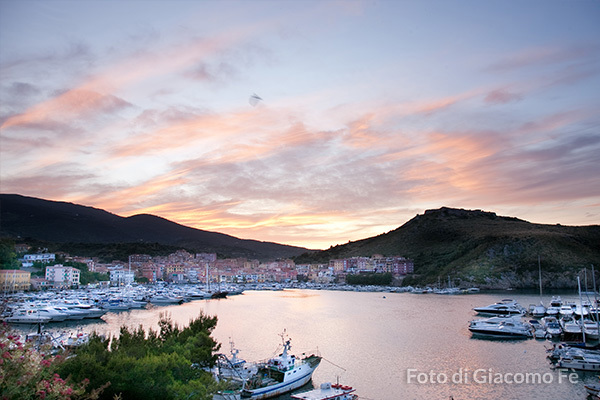 The Monte Argentario district takes is name from a peninsular opposite the Islands of Giglio and Giannutri. It encompasses the small towns of Porto Santo Stefano and Porto Ercole, which can be counted amongst the most beautiful towns in Italy. The Argentario area is a well-known vacation spot and a favorite among VIPs. It also frequently features as a location in films and television adverts. This holiday destination is noted for its breath-taking scenery, while every small cove or beach is outstandingly beautiful, surrounded by nature and utterly unique. The mighty Rocca Aldobrandesca fortress towers over this fishing village with its distinctive character coming from the charming alleyways of the old town and the fortifications which were all built to defend the peninsular. Among these forts are the sixteenth century Forte Filippo, Torre del Mulinaccio and the seventeenth century Forte Santa Caterina. Following a scenic road leads to views of the imposing and elegant Forte Stella, so called because it takes the shape of a six-pointed star. This allowed enemies approaching the Stato dei Presidi (state of garrisons) to be spotted from any direction of the compass. This sought-after tourist destination is set in a bay overlooked by the imposing Spagnola Fortress. Long ago, the ancient peoples who sailed the Mediterranean would stop here, and traces left by the Romans are of particular interest. After this arrived pirates who inspired captivating legends and tales. The port is home to an impressive fishing fleet as well as boats and yachts. 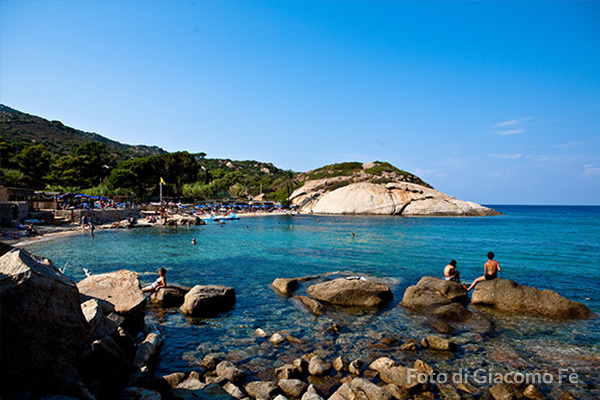 It is also the departure point for ferries to the islands of Giglio and Giannutri. About 60 km from Residence il Poderino, on a rocky outcrop, stands the town of Pitigliano. Known as ‘Little Jerusalem’, it was once home to a Jewish community, and this has left significant marks and influences on the town. 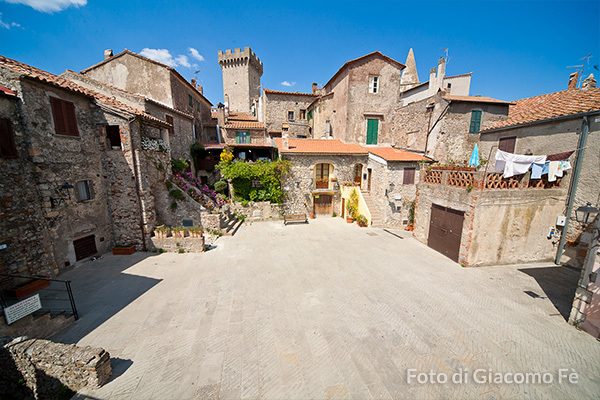 Here in the town’s narrow streets, you can retrace historic footsteps by visiting the Jewish ghetto, the kosher bakery, the synagogue, the Civic Archaeological Museum of Etruscan Civilization, the Alberto Manzi Open Air Archeological Museum, the Diocesan Museum of Sacred Art and savor the scent of wine cellars dug into tufa, a soft volcanic rock. Evidence that this was once a substantial Etruscan center can clearly be seen in a beautiful necropolis, known as the Ildebranda Tomb, which is immersed in the Tuscan countryside. In medieval times, the town was an independent city state as well as an episcopal see, and is now regarded as one of the most beautiful towns in Italy. Something in the air gives Sovana a unique ambiance. It can be felt in the twelfth century church Chiesa di S. Maria, in an old building said to be the birth place of Ildebrando di Soana (Pope Gregory VII) and in the picturesque Cathedral at the edge of the town. A characteristic group of rock buildings carved into the tufa, bring to mind the Sassi di Matera in Calabria. Towering above the town is the imposing Fortress of Orsini, which these days houses the Middle Ages and Renaissance Museum. Between them, Sorano, Sovana and Vitozza make up the Città del Tufo (city of tufa) Archaeological Park, which includes numerous Etruscan rock necropolis, with burial chambers, shrines and temples. These are linked by Vie Cave, or ‘sunken roads’, fascinating pathways which the Etruscans cut into the rock. The extraordinary town of Pitigliano is located about 60 km from the hotel. 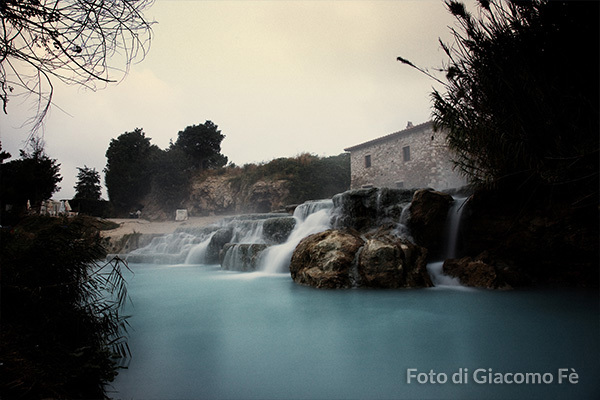 In the Manciano district, about 55 km from the hotel, are the famous Terme di Saturnia. The waters of these hot springs flow all year round at 37°C and contain sulfur minerals with therapeutic properties. The thermal area can be accessed at Cascate del Mulino, in natural surroundings which are heavenly for both body and mind, or from the luxurious spa facilities at the hot springs. 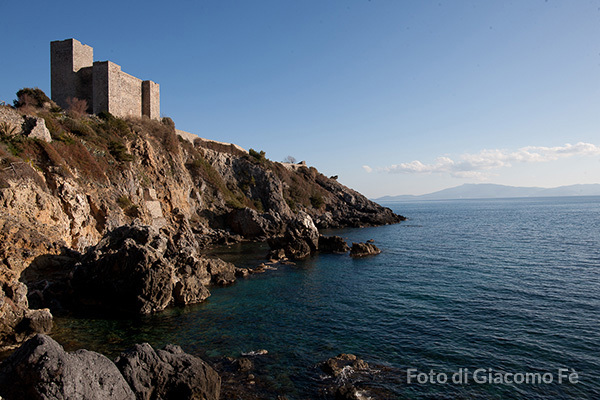 Parco della Maremma Nature Reserve extends along 25 km of coastline from the mouth of the river Ombrone to Talamone. It covers green hills, long beaches, rocky cliffs, ancient pine forests, fields and pastures. Along trails through Parco dell’Uccellina smell the pleasant perfume of aromatic herbs, see colorful berries and hear the sounds of local-breed cattle and horses. The park can be explored on foot, by horse and cart, by canoe, on horseback or by bicycle, as there is also a cycle path. An unforgettable experience of nature, culture and adventure, just 15 km from our apartments! 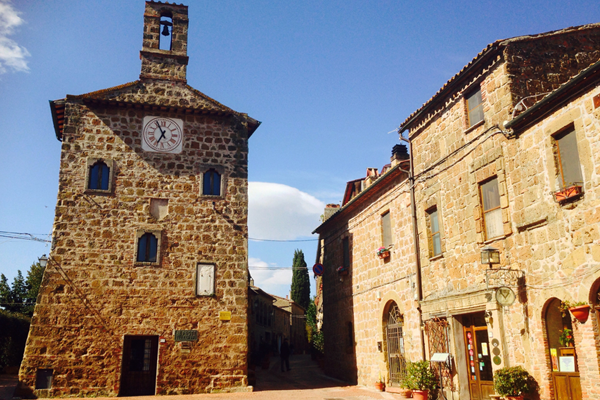 The town of Capalbio is the most southerly town in Tuscany and less than 40 km from the apartment hotel. For many Romans, it is a place to relax and escape the city. Here in 1895, during a gun fight with the carabinieri, the bandit Tiburzi, known as the Robin Hood of Maremma, king of the macchia, was killed. Even now, people still talk about the story. The Giardino dei Tarocchi (Garden of Tarot) in the Capalbio district is a sculpture park created by the Franco-American artist, Niki de Saint Phalle. It exhibits 22 impressive steel and concrete figures covered with glass, mirrors and colored ceramics. A journey through the park engages and fascinates adults and children alike with something between magic and playfulness. Throughout the park, comparisons can be drawn with Antoni Gaudi’s Parque Guell in Barcelona, statues in Parco dei Mostri (Park of Monsters) at Bomarzo and Native American art. This coastal saltwater lagoon is located at the southern end of the Grosseto area in Maremma and is classified as a wetland of international importance. Once a hunting reserve, it encompasses an uninterrupted stretch of coastline of sandy dunes and Mediterranean vegetation, including holm-oak, prickly juniper, and myrtle. Standing prominently on the lake is a sixteenth century tower which once marked the border between the Grand Duchy of Tuscany and the Papal states. This is a paradise for photographers and nature-lovers, as well as a great opportunity for the young and the not-so-young to see the many species of waterfowl which inhabit the lake or stop there during migration, such as pink flamingos, cormorants, egrets, coots, mallards, spoonbills and ospreys.